Leading professional tenor horn boasting the perfect sound and enough power to fulfil any musical challenge. Innovative leadpipe design rewards the player with a free blowing, big sound giving exceptional sonority. 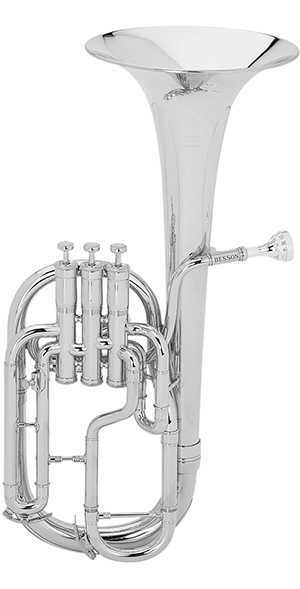 Ideal for the individual as well as brass bands where it has the capability to both blend and have soloistic presence. Bell rim rolled and soldered over brass wire - adds strength and protection to the bell. Valves: 3 top sprung stainless steel valves. Delrin valve guides for quieter valve action. Finger buttons inlaid with mother of pearl. 3 Water keys with synthetic rubber seals - gives a perfect seal. Precision fitted slides for ease of tuning. Non corrosive nickel silver inner valve slides. Stainless steel non-corrosive pistons - durable smooth action. Famous leadpipe design into 3rd valve.